Navigating through multidimensional data cubes is a nontrivial task. Although On-Line Analytical Processing (OLAP) provides the capability to view multidimensional data through rollup, drill-down, and slicing-dicing, it offers minimal guidance to end users in the actual knowledge discovery process. 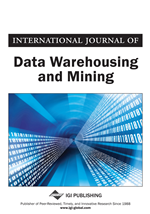 In this article, we address this knowledge discovery problem by identifying novel and useful patterns concealed in multidimensional data that are used for effective exploration of data cubes. We present an algorithm for the DIscovery of Sk-NAvigation Rules (DISNAR), which discovers the hidden interesting patterns in the form of Sk-navigation rules using a test of skewness on the pairs of the current and its candidate drill-down lattice nodes. The rules then are used to enhance navigational capabilities, as illustrated by our rule-driven system. Extensive experimental analysis shows that the DISNAR algorithm discovers the interesting patterns with a high recall and precision with small execution time and low space overhead.